Where can I get the SourceCode for the Stream capable client ? I'm interested in porting it to linux. Message 14567 - Posted: 9 Mar 2009, 20:23:46 UTC - in response to Message 14533. The whole thing is work in progress and I will share the code with Travis when it's finished. The readme supplied with the GPU app states my view on this topic. Message 14571 - Posted: 9 Mar 2009, 21:02:19 UTC - in response to Message 14567. Message 14585 - Posted: 9 Mar 2009, 21:42:04 UTC - in response to Message 14567. Exactly what version did you use as a base? One I found (0.7) had no license notice at all. Just in case you used that one or a similar once: code with no license doesn't automatically give you infinite rights over it. <ams> you can't do squat with it, sorry. <ams> PovAddict: well, they are violating copyright law then. <ams> right, then there is no license, and the person is distributing the program illegally. Please use "Reply" or "Quote" buttons on posts, instead of "reply to this thread". Keep the posts linked together ("X is a reply to Y"). Message 14639 - Posted: 9 Mar 2009, 23:54:28 UTC - in response to Message 14585. Just in case you used that one or a similar once: code with no license doesn't automatically give you infinite rights over it. I know. There is still the copyright issue. From a legal standpoint the MW project could demand to stop the distribution. Do you think that would help the project? Message 14662 - Posted: 10 Mar 2009, 0:43:49 UTC - in response to Message 14639. This is what happens when alpha test applications are tested via public community vs. private. Almost always, someone wants the source & questions/challenges come-up re: GPL. With developmental alphas, there's risk to distributing code that may not be 100% sorted that could end-up in mass public distributed binaries compiled by someone else. A developer's interest & motivation for controlling the source of a alpha dev. app is valid. Question is whether it's legal. Hat's off to you Cluster for your amazing work and accomplishment! Message 14816 - Posted: 10 Mar 2009, 21:58:53 UTC - in response to Message 14746. If he was modifying GPL code, he would have the right to keep everything to himself. But as soon as he releases binaries, he MUST release source code, at least on request. It's not about good or poor form, it'd be a legal requirement. If "distributing alpha code is a risk", and you don't want to do it, you can't release binaries either. However, he didn't modify GPL code. He modified old code which had no license at all, in which case he didn't even have permission to modify it, not even for personal use. "All rights reserved". Unless the copyright holder (Travis; although the code lacks clear copyright notices as well) gives him explicit permission. Of course, the only one with a clear right to complain (or file suit :P) is Travis, and he obviously won't do that, since he (now) agrees with the work being done, which I guess counts as having given permission to Physik to do what he's doing. Talking about copyright, ist this GPL? Message 14838 - Posted: 10 Mar 2009, 23:47:51 UTC - in response to Message 14826. Open the file yourself; does it say "you can redistribute it and/or modify it under the terms of the GNU General Public License as published by the Free Software Foundation" and does it include the full text of the GPL somewhere in the program distribution? If it does, then it's GPL. If it doesn't, does it say in some other way what exactly you can do with the code? If it doesn't, then you aren't allowed to do anything with it. EDIT: the software in Numerical Recipes "cannot be freely redistributed in modified (or unmodified) version — it is issued under a non-free licence". It's incompatible with the GPL. GPL code (like MW app) cannot use code from that book. Message 14839 - Posted: 11 Mar 2009, 0:01:17 UTC - in response to Message 14826. Message 14840 - Posted: 11 Mar 2009, 0:03:35 UTC - in response to Message 14816. As mentioned earlier by another poster, there's a certain amount of quid pro quo going on anyway. Also, source was previously released so that another volunteer dev. could do a OSX port that the project lacked software & licenses. Travis was faced with several problems at the same time. So, he opened the code while he looked into the various license options. So, this allowed development while discussions raged about which version of open source license should be used. So, yes, CP is in technical violation, but not in spiritual violation. As to releasing the code. I would lean towards his position in that he has said that he will, when it is stable. I think that this is a responsible position particularly with the code moving as fast as it seems to be (with only one developer). I've seen these type of GPL and license discussions multiple times (as have you Paul) with other projects. It's clear that GPL isn't very well understood by many projects that are based on it & there are differences in understanding between devs. & even less understanding w/ casual crunchers. I think a general "assumption" in many cases is that when source is released by admin of project that "is" or intends to be "GPL", the gates are open. So, overall understanding of GPL re: to DC projects is generally lacking across the spectrum. That said, GPL requirements may not actually align very well with the typical kind of volunteer development efforts we're used to seeing here or other DC projects at all. A dev. has responsibility for the results of his released binaries to the project & also to the users. Unlikely that a single dev. has all the multiple platforms (Intel, AMD, & all CPU flavors w/ various SIMD limits) to test & verify proper function of each. So, in strictest interpretation of GPL, he can only keep source private based on what he can test himself. As soon as he gives a binary to someone else to test on a rig he doesn't have, he's obligated to make the source available "upon request". Over the years, I've seen well tested optimized binaries that were thought to be suitable for public, have to be recalled or updated when unknown issues surfaced after running on enough hosts to produce & gain visibility to them. Have also seen several "alpha" binaries that did not perform to expectation or provide anticipated results, even when a simple SIMD compile variant of the same source. Projects wouldn't want untested or bad opt. binaries released & devs wouldn't want the responsibility of bad binaries or bad source being in the wild. So, GPL doesn't seem to align well w/ volunteer optimizing on the scale necessary for multi processors and platforms to support a community. It's clear however that public involvement in alpha/beta development is a slippery & risky slope w/ GPL requirements and the current dev & public interests of MW (or any other open source DC community). A slope that isn't very "motivating" towards encouraging volunteer efforts unfortunately. Message 52135 - Posted: 31 Dec 2011, 14:47:28 UTC - in response to Message 14895. As to releasing the code. I would lean towards his position in that he has said that he will, when it is stable. Actually, the code for the exact binaries you are executing should be released to ensure people can port to platforms not even recognized... what should happen if somebody on a comodore amiga wanted to port the code and had fast enough a processor? what if somebody at a company like cray wanted to test their new processor on a project like this? you NEED the code for the currently executing binaries to be released if for nothing else but to allow computers that are not compiled by yourselves. take my situation, quad core powermac G5, 2.5 ghz cpu speed, mac osx 10.4.11, the n-body simulation isn't released for my platform so i'd like to compile it for my platform and do some work. Message 52470 - Posted: 14 Jan 2012, 7:15:43 UTC - in response to Message 14912. So, GPL doesn't seem to align well w/ volunteer optimizing on the scale necessary for multi processors and platforms to support a community. BOINC's code signing procedure prevents unauthorized binaries from doing work, at least when the BOINC client isn't being fooled. A volunteer assumes the risk of joining a reputable project (not secretly producing Bitcoin for the project admin, for example). But even projects exploiting volunteers for profit should be concerned about resources being misappropriated by unauthorized clients. This URL mentions server hacking, however botnets pose another risk for subverting BOINC clients. As a volunteer, I expect a project's admin to sign code to protect my interests. My concern is that the cycles I volunteer actually benefit the projects to which I subscribe. 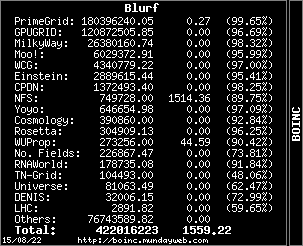 I would find out if my BOINC credit rate drops without explanation, which is what should happen when a machine's computational power is taken over by an unauthorized client, whether I've been duped into installing an application that claims to produce credit faster, or the machine has been subverted by a zero-day exploit. So admins, don't just complain about code getting out of your control, take charge and sign your binaries. Developers who want to increase credit production in a fair manner will be motivated to cooperate and contribute back their useful improvements. Does the BOINC client sign completed results with the application's signature so the server can verify authenticity of the application? Then a project server can simply ignore a returned result if it isn't signed with the project's public key. No need to use the private key for verification, just recompute the result's signature with the public key in the validator. This will impact throughput of the project server, but that's the price to pay for security. A less secure way would be to sign results before sending them to a client and have the client verify the application, but this does not protect from a patched BOINC client and it saves no work at the server. Message 52471 - Posted: 14 Jan 2012, 9:19:04 UTC - in response to Message 52470. That was a tad hastily written, now I have to correct myself. Nothing can stop a patched BOINC client from falsely reporting the identity of an application.